Your Secret Garden; Haute Horticulture | OhGizmo! By Ryan Nill on 09/25/07 • Leave a comment! Questionable fashion gets an “Eco” twist in this chunky ring that features haute horticulture. 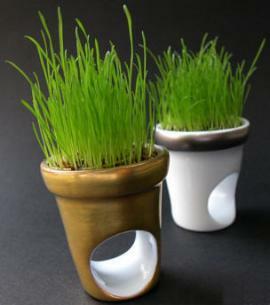 The large porcelain fashion rings actually come with compost and seeds; you grow your own fashion statement. It takes about 15 days for the ring’s seeds to sprout and mature, after that it will be ready to wear. Sure, they’re dangerously green, maybe a little less than dangerously stylish. They also are dangerously expensive, with prices between 70 and 120 Euros.